Sir Thrift A lot: Sir Thrift-A-Lot in Rednesday! 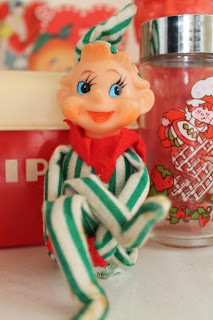 I don't think I have ever blogged this early - it's before 7AM on Rednesday morning! Dog woke me early, so I've got nothing else to do before work besides watch the news. I'm usually running around like a mad man. 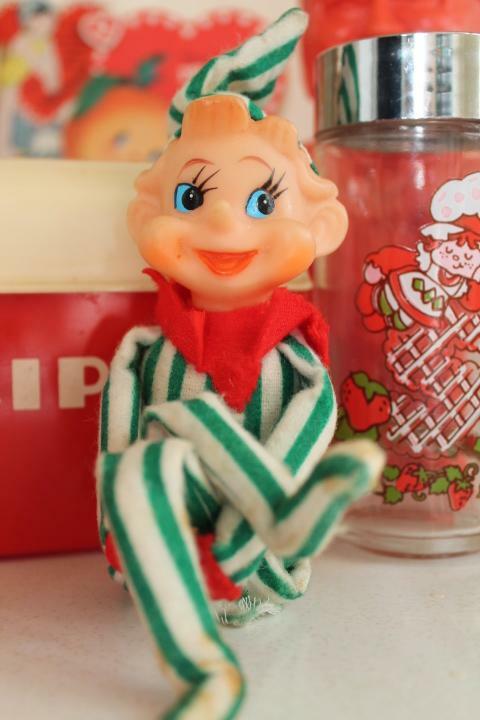 This knee hugger elf has experience in Christmas cheer. You can see it on his feet. On his back. On his hat... OK, so he's been around the block, but he's finally made it home. 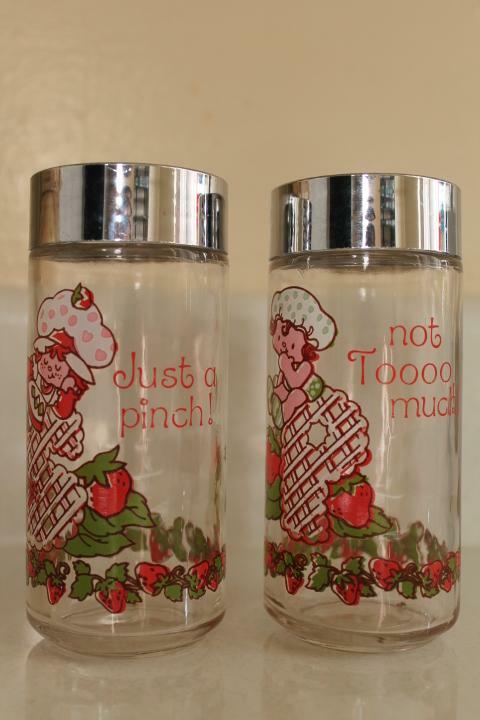 A pair of 1980's Strawberry Shortcake salt & pepper shakers from Columbus. I had just bought a metal recipe box a couple days before picking up this one (have yet to feature the yellow), but this Lustro Ware box was the one I was waiting for. Also a few vintage Valentines! I'm not sure how I got into collecting Kentucky Fried Chicken collectibles, but I have. & what's a post without Pyrex? Even if it's a common enough piece? 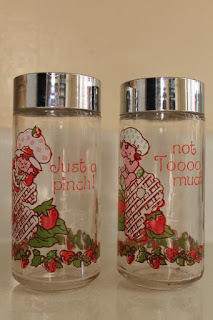 I actually found a set of the Strawberry Shortcake shakers at the thrift the other day and almost bought them to send to you but they weren't in perfect condition! It was meant to be that you would find them on your own, I guess. I didn't know that Lustro Ware recipe box existed. Now I have to find my own. Good luck finding a recipe box.. I'm sure you'll have no trouble. Your finds always AMAZE me. It is! Very rare in Canada, too. hahaha That's too funny! 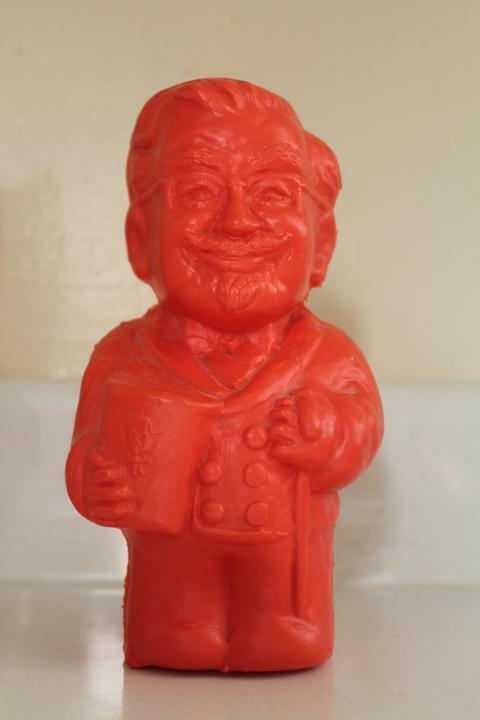 One day you wake up, and realize that you're a collector of Kentucky Fried Chicken memorabilia! This is my kind of post! SSCake, Pyrex, Vintage Valentines, and a Knee Hugger! LOL. Yeah, hope it doesn't happen with those green Glasbake pieces! My granddaughter would love those shakers. She is 3 and loves Strawberry Shortcake! I love the lustroware box! I saw the Kentucky Colonel on the freeway once while driving in Louisville. Quite the gentleman!